The recent royal wedding between Prince Harry and Meghan Markle cast the spotlight on fairy-tale weddings. Images of a young couple who are madly in love and vow to spend the rest of their lives together, filled with expectations of a perfect marriage, are what fairy-tale weddings are made of. The truth is that not all marriages end up being the stereotypical fairy tale we know and love. In fact, 25 326 divorces were granted in South Africa in 2016. This is according to a recently released report by Statistics South Africa on marriages and divorces. According to the report, men tend to marry younger women. More than 76% of bridegrooms were older than their brides, compared to nearly 16% who were younger than their brides. Only 8% were the same age as their brides. Men are also more likely to marry women who had never been married before. Nearly 94% of bachelors married women who had never been married before, and only 1% married divorcees. Since Meghan Markle is three years older than Prince Harry and divorced, this sets our darling Prince Harry amongst a small group of men that go against the norm. The median ages at which men and women marry has increased since 2002. New data shows that the median age of bridegrooms increased from 34 years in 2012 to 36 years in 2016 and that of brides increased from 30 years to 32 years during the same period, suggesting that couples may be delaying marriage. It may also feed into the more recent phenomenon that marriage may be shifting again as millennials (those born in the 1980s and 1990s) are either not marrying at all or marrying much later. For those who do make it down the aisle, the most popular time to get married is generally during the warmer months, beginning from September and peaking in December. The results also show that solemnisation of marriages shows a second peak in either March or April, depending on which month the Easter holiday falls for that particular year. Peaks also seem to be linked to the school calendar for long holidays, which allows many people to travel to participate in the marriage celebrations. Unfortunately, a high proportion of couples will have a “happily ever after” that lasts less than 10 years. Results showed that four in ten divorces (44,4%) of the 25 326 in 2016 were marriages that lasted for less than 10 years. Irrespective of the population group, the highest proportion of divorces were among couples who had been married for five to nine years. The results showed that 31,7% of the black African group, 25,4% of coloureds, 25,0% of whites and 22,4% of Indian/Asian couples who divorced had marriages that lasted between five and nine years. The white population had the highest proportion (22,6%) of divorces that occurred in the first five years of marriage. 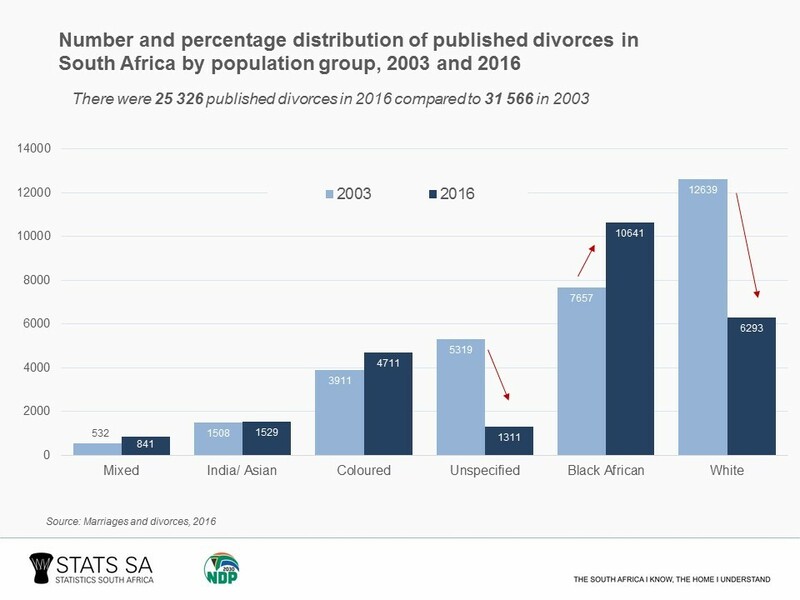 Generally, the proportion of divorces for black Africans increased while that of the white population group declined from 2003 to 2016. For more information, download the Marriages and Divorces, 2016 release here.